Nice place for sweet carving people, varieties of option for foodies everything on a budget.But for lunch or dinner they will make a hole in your pocket. So for breakfast and sweets rush for it. 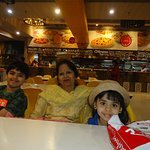 It is difficult to find clean restaurant in Old Delhi at Karol Baug. Bikanerwala, Angan changes the opinion about a restaurant. One of the cleanest restaurant on this dirty track. It is 4th generation restaurant with technologically equipped tracking to avoid rush at serving counter. The morning breakfast is absurdly cheap at Rs. 50 with 4 varieties, tasty and keep your belly sufficient till late evening. Chinese platter at Rs. 230 is the best. It is brightly lit and at prominent location. Must visit. The shop offer more than 100 type of sweets leaving you in dilemma which to buy and which not to buy. However this sweet heaven is worth every penny that you pay. The smell of the sweets as you enter the shop is good enough to empty your wallet. A must place to buy sweets when you are in Delhi. Its clean and yummy. You can also taste before buying. Place for a quick eat. The ground floor is for chaats,kulfi and sweets and the top floor is a self service mainly for North Indian food. For North Indian food we tried their thaali, it was very good. A little high on calories but it's North Indian food after all. 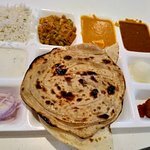 They serve 2 rotis, 2 sabzi(paneer matar and dal fry) along with raita and jeera rice. Food is good but not exceptional. However, we tried moong dal ka halwa in the sweets section and it was the best I have had. My friend tried Kulfi for which he said was very good as well. Been to Bikanervala Angan? Share your experiences!